Curious what other people have to say about our project? 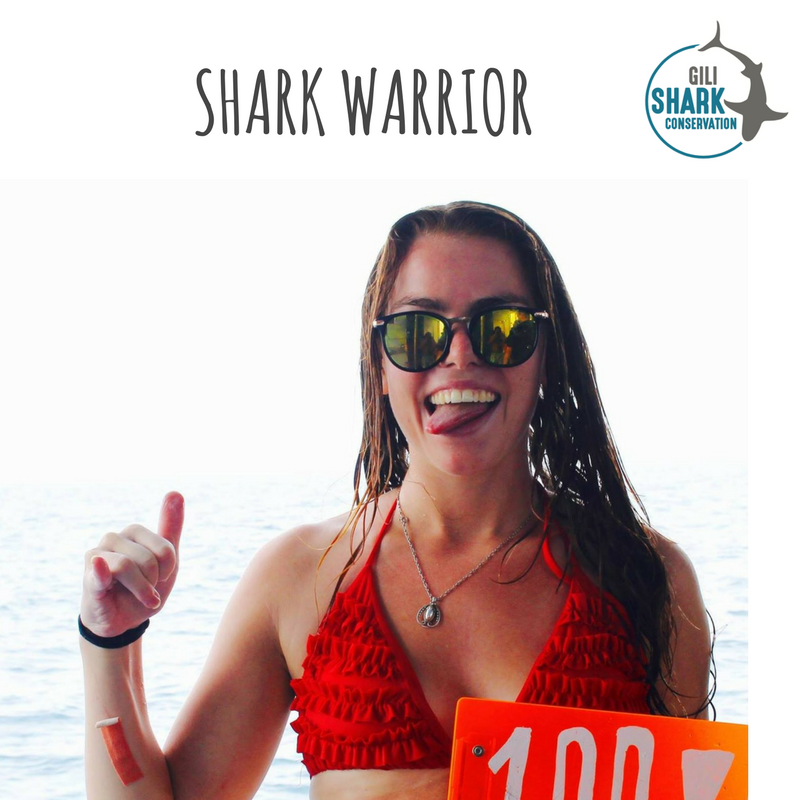 Read below the reviews of some of our Shark Warriors. And if you can’t get enough of reading the experiences of our participants, have a look at our reviews on GoOverseas and GoAbroad. My first time diving was in Thailand and I fell in love with it immediately. I became obsessed with this whole other world underwater, which led me to study Marine Science in university. After my first year of university I was searching for something to occupy me over summer break, preferably something that included scuba diving. What began as a simple google search for marine conservation internships has led me to experience the best two weeks of my life. The Gili Shark Conservation Program has not only taught be so much about marine conservation, scientific diving, and shark conservation, but has also introduced me to the best group of people. The community found here in Gili Air is truly amazing and unforgettable; I have loved every second of this project. For the first time as an adult, I decided to quit my job and travel for 3 months, wanting to experience life in a way I had not previously. I literally lucked into the Gili Shark Conservation program (thank you Lauren and Rose), especially with such little previous diving experience. When you start every day on such beautiful water, its really easy to be happy. Simple life, and such incredible people. That was my favorite part. The hospitality was stellar at Villa Nangka, and is a no brainer if you have the opportunity to visit. What an awesome life experience! After graduating university in England with a degree in Zoology, I was feeling a little uncertain as to whether I was going to continue towards my dream of becoming a marine ecologist. I had contemplated a few different paths before deciding to set off on a year of solo exploration and travel. I started with an amazing coral conservation project in Thailand, which left me very hungry for more scientific diving and conservation experience. 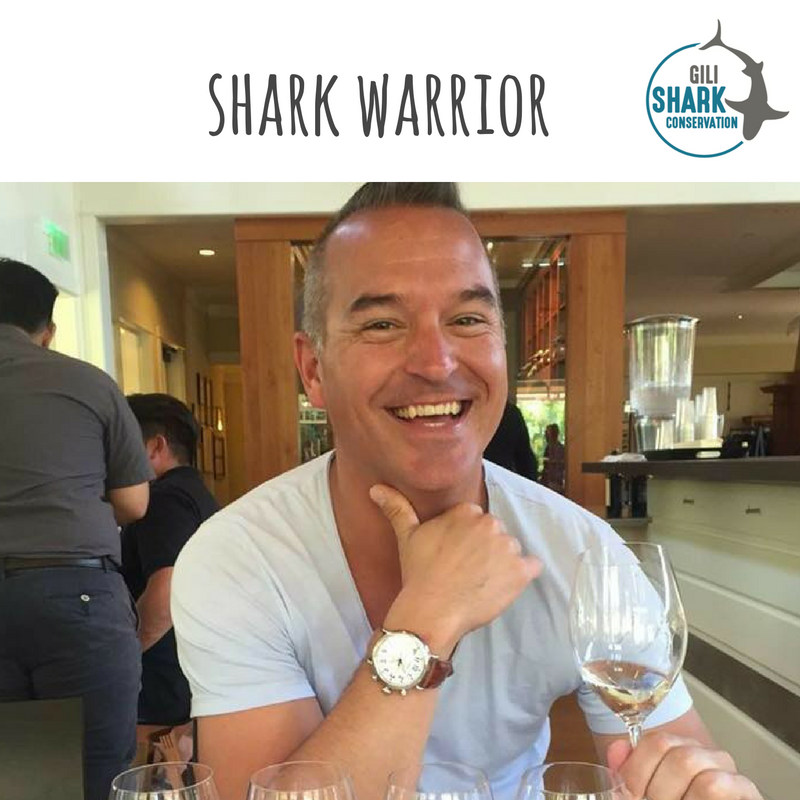 When I found the Gili Shark Conservation project online I immediately sent in an application and eagerly awaited a response. Upon receiving the happy news that I had been accepted, the excitement and anticipation began. Gili Air is a paradise that I was fortunate enough to make a home away from home! 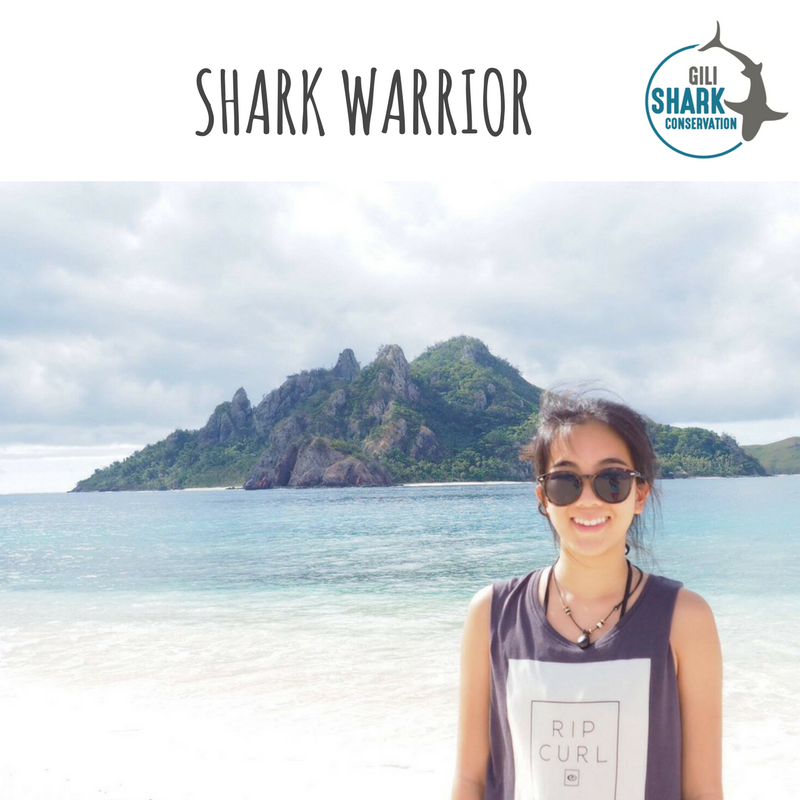 I joined the Gili Shark Conservation Project for a few weeks and it took my passion for marine life and conservation, multiplied it by 100 and prepared me to act on it. 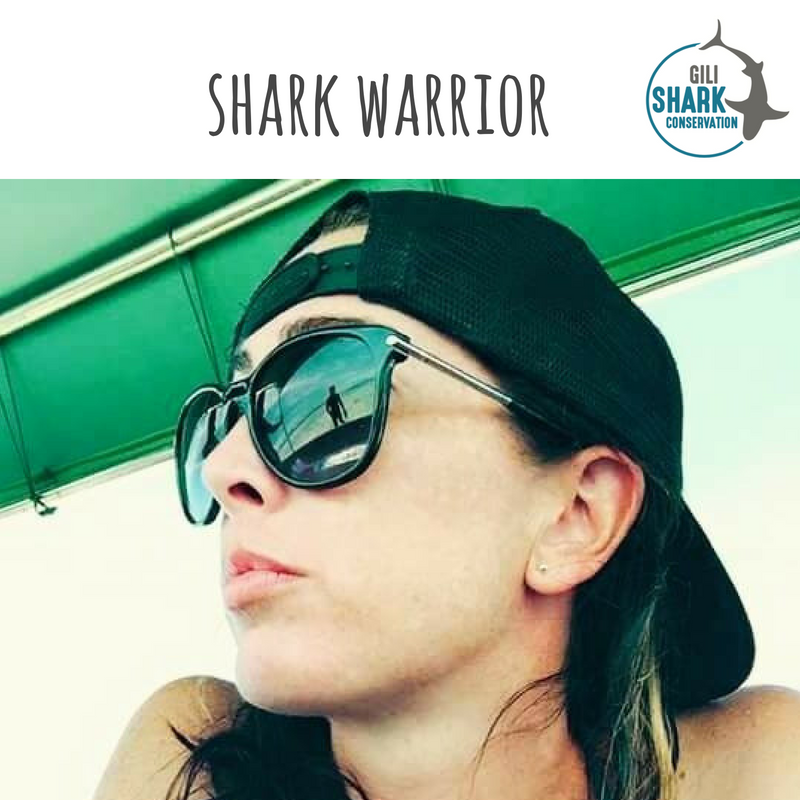 I was able to go from a novice diver to a professional with certifications in research and shark ecology, making my graduate school and career applications exponentially stronger. This is the main reason I joined the team, practical experience. What I did not know I’d be gaining were the invaluable memories and life-long friendships. Gili Air is a paradise that I was fortunate enough to make a home away from home! I was nervous that I would be constantly comparing my experience here to my memories of Thailand and that I was potentially setting expectations that could not be fulfilled. I couldn’t have been more wrong. I arrived on Gili Air late on a Sunday night and was warmly welcomed to the island with the biggest smiles that made me feel immediately comfortable. The speed at which my relationships built with the team and everyone here was astounding and incredibly gratifying. My love and passion for animals and the marine environment was only nourished by this project. Not only are you immersed in a jaw dropping setting; you’re also surrounded by a plethora of like-minded individuals. Thanks to the amazing environment and experiences fostered by the staff here, I can now say happily and with confidence that I’m back on track to following my dream of applying to get my Msc in Tropical Marine Ecology. This project, including the family, friends, memories and experiences I have gained from it will truly stay with me for the rest of my life. Ever since I was a little girl I’ve had a passion for animals and their well-being. Having grown up on the East Coast of the United States, a love for the ocean was fostered in me from a young age as well. These two passions only grew stronger in me as I began to explore the incredible world of science in my high school career. I devoured every class even remotely related to science, animals, and the sea, and discovered the world of conservation. Immediately, I knew this was the field I wanted to enter. I pursued this further in university, but I still never felt as though I was able to have the conversations I wanted to have with my peers or get the information I was searching for from professionals in the field. 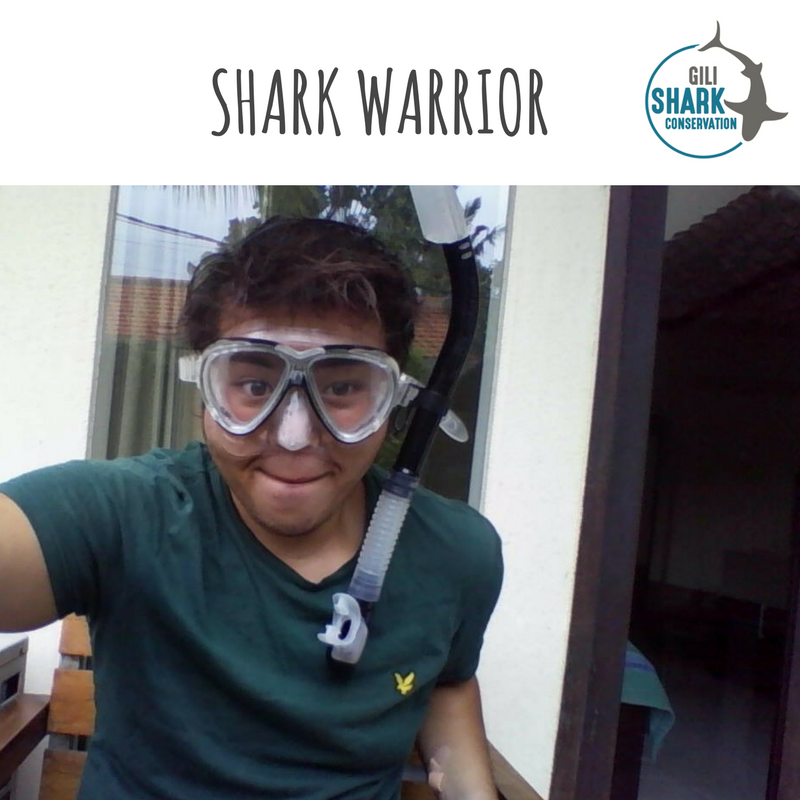 Being at Gili Shark Conservation was a fantastic experience for me. I learned so much valuable information about scientific data collection and research diving, furthered my own diving skills by completing my rescue course and made some lifelong friends in the process. Everyone who taught me was so patient, professional and fun! 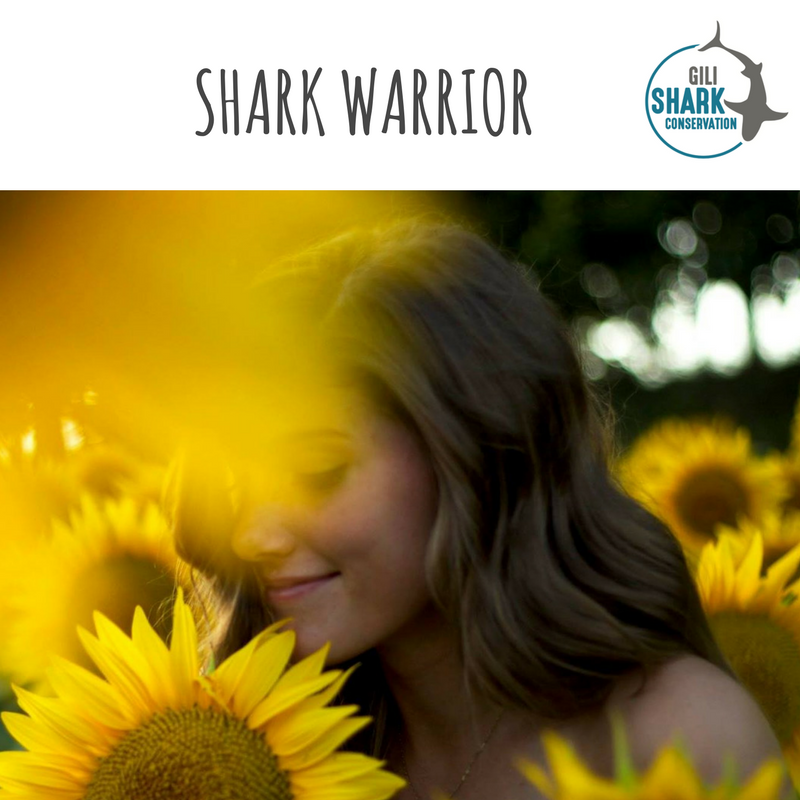 The research team of the Gili Shark Conservation Project is doing vital work for one of the best causes in the world – I feel privileged to have been a part of the team, even if for a short while. I can’t wait to come back and spend my time again wit the project very soon! My experience in Gili Air helping out the research team of the Gili Shark Conservation Project has been great! Each morning, we would be greeted by the local Dive masters and boat captain who would always look cheerful before we headed out diving. Dropping the BRUV with the research team of the Gili Shark Conservation Project has been insightful! Putting the bait in the bait cage would entail other divers in asking what we were doing which we were happy to tell them. In conclusion, each person involved in this project has been indubitably awesome. My time with the Gili Shark Conservation Project has been so much fun and I can’t wait to come back one day! I have always been fascinated with sharks and the big beautiful ocean, so getting my scuba diving certificate was on the top of my bucket list. That seemed like a far fetched dream, living in Upstate New York. I was also getting frustrated not being with like-minded people. I longed to meet people who were passionate about sharks and marine animals like I am and that’s pretty hard to find in New York. 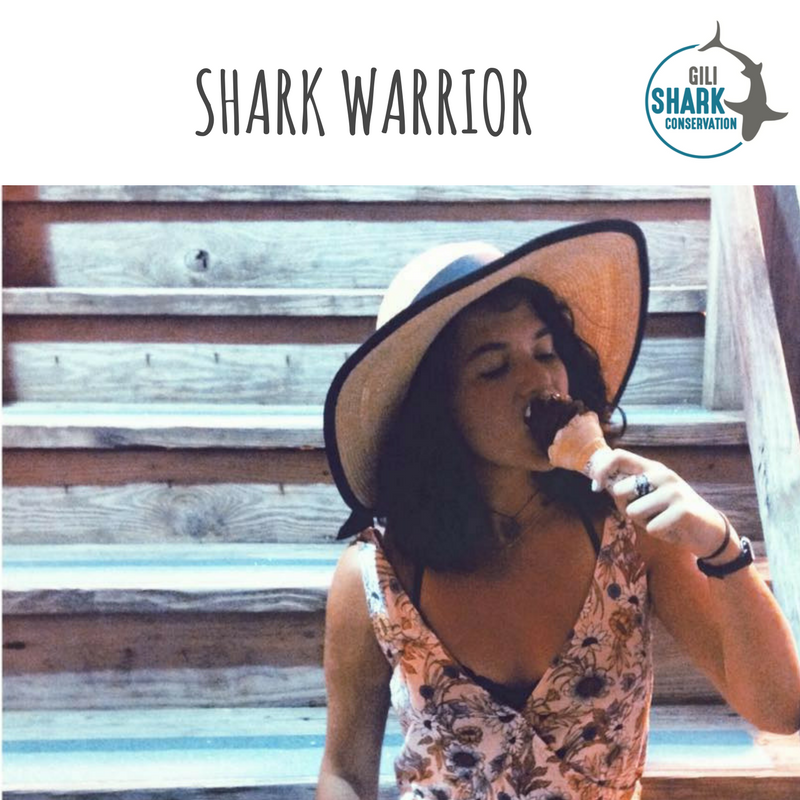 I just finished my third year of college and I wanted an experience that would prove to me that shark conservation was definitely something I wanted to pursue for a career. I found out about the Gili Shark Conservation project online and applied. It sounded like a fantasy so when I got the acceptance, it was surreal. The thought of actually getting my scuba certification and going to Indonesia blew my mind. This was my very first time out of America and it has been an amazing experience. Everybody on the team is so kind and has a great sense of humor. They also are very open minded and willing to work with all kinds of people from various backgrounds, like myself for example, being a deaf woman. This trip taught me not to be afraid to do anything. All you need is passion for the ocean and the rest will follow. Every day, I was smiling, and so was everyone else. I’ve never experienced that before. 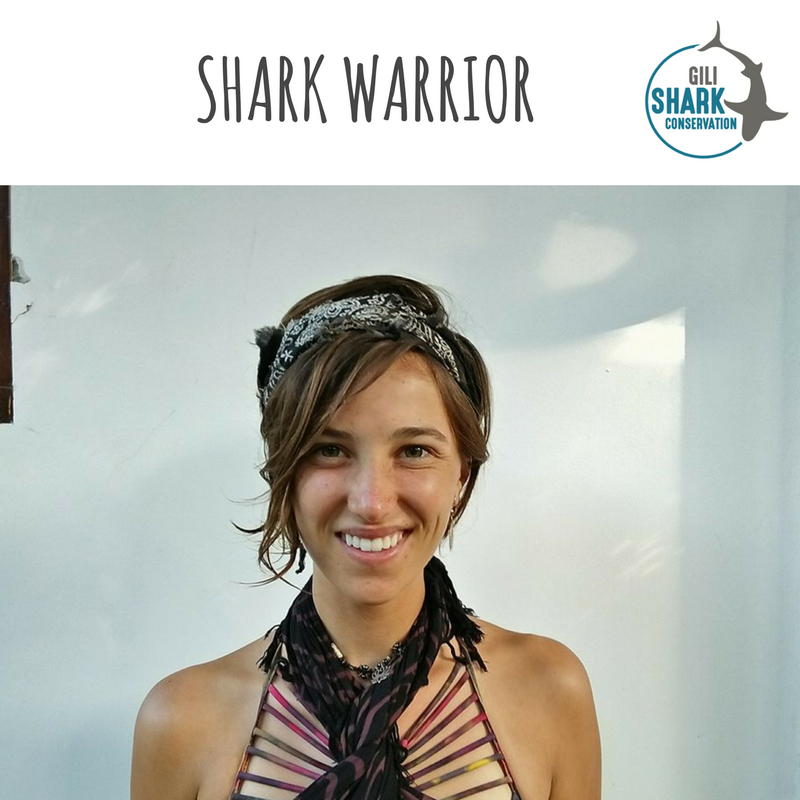 I am ecstatic that there are people out there like the Gili Shark Team that are fighting for the sharks and doing beach cleanups and other inspiring, eco-friendly projects. Gili Air is everything I love; diving, good food, good vibes, and most importantly, shark conservation! Having the opportunity to work with others that have the same goals about shark conservation has been one of the most rewarding experiences I’ve ever had. 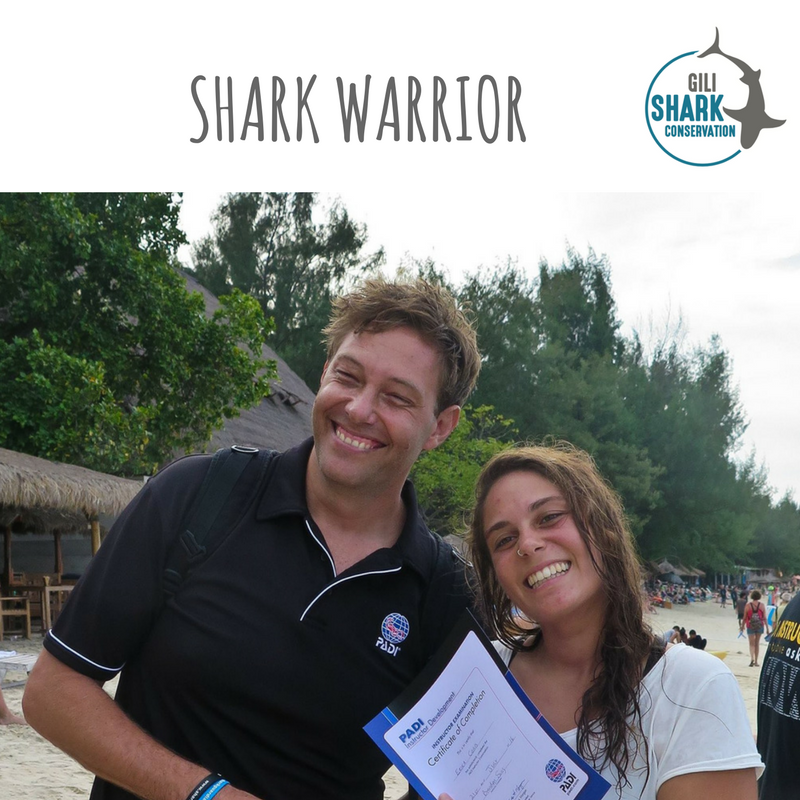 My time with Gili Shark Conservation was a very positive experience. My peers, advisors, and mentors were always very supportive and knowledgeable, and I always felt like everyone was very approachable. The staff at Villa Nangka were very welcoming which created a comfortable home environment and a sense of family. The dive instructors from Oceans5 were all very funny, down to earth people that made difficult courses enjoyable and less intimidating. Our daily survey dives were always a new and fun adventure that taught me useful skills and helped me become a better diver. While working side by side with the other shark warriors everyday, I built special bonds with each and every one of them that I will cherish for the rest of my life. The Gili Shark Conservation Project also helps the participants be active within the community through weekly beach clean-ups and uniting the community to learn about and support shark conservation. 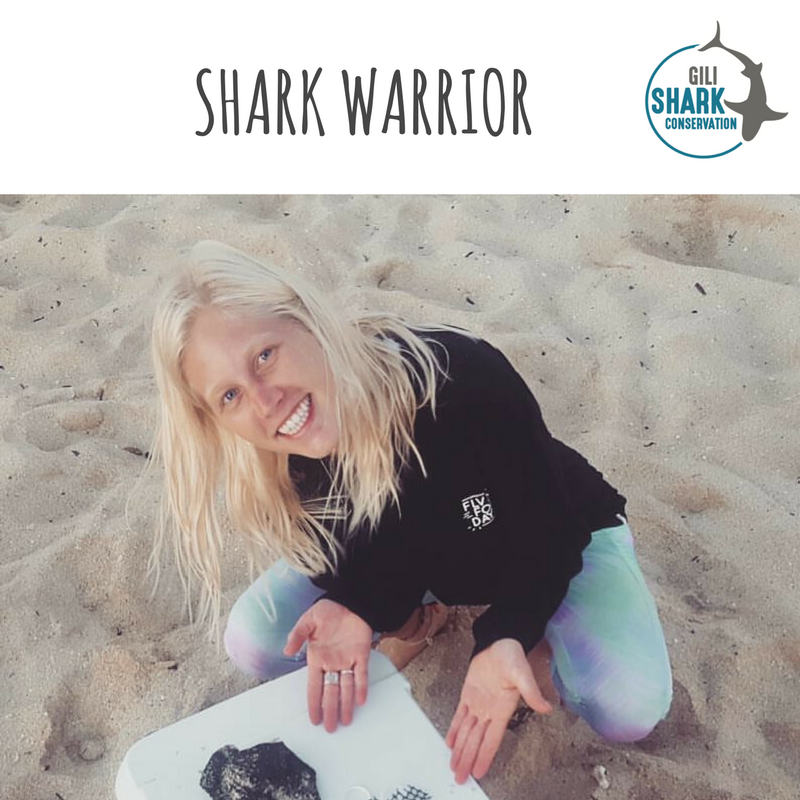 Having the opportunity to work with others that have the same goals about shark conservation has been one of the most rewarding experiences I’ve had, and I would definitely do this again. I loved the two conservation programs I did in the Seychelles (one doing coral conservation and one doing whale shark conservation). As it was almost 4 years ago, I decided it was time to go back into the water and look for a new conservation program at a different side of the world. After a lot of searching I found the Gili Shark Conservation Project. It’s located on Gili Air, a small Island just of Lombok in Indonesia and I immediately felt like home! The research team is excellent and the staff of Villa Nangka are singing stars. I wish I had got into marine conservation when I was a lot younger as I would have loved to have made a career out of something I enjoy. I would definitely recommend marine conservation as a holiday for anyone interested in diving. 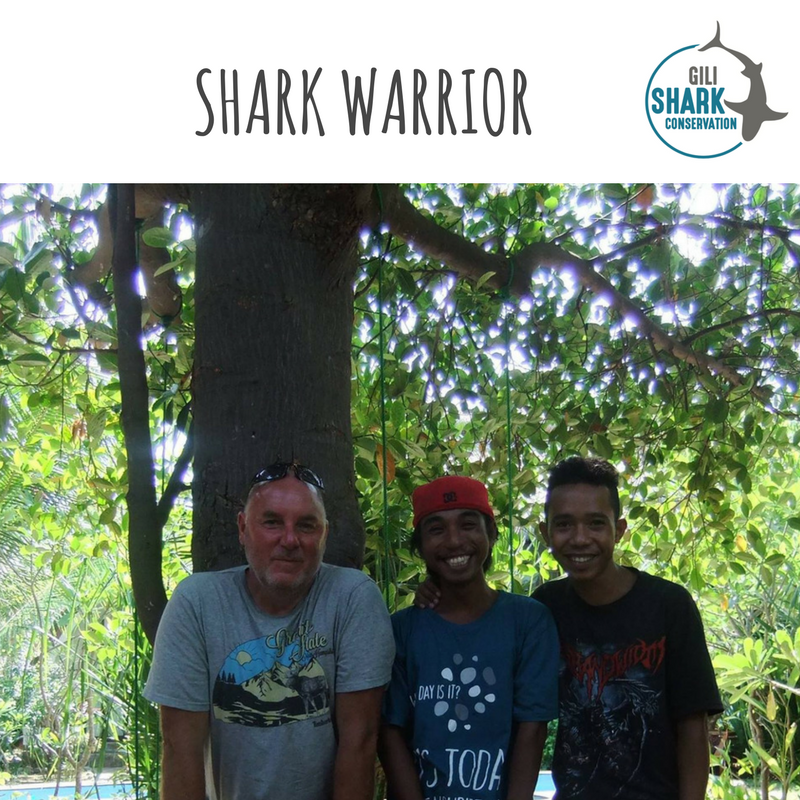 The Gili Shark Conservation Project will not disappoint you and the people you meet will be your friends for life! It has been the best experience ever! 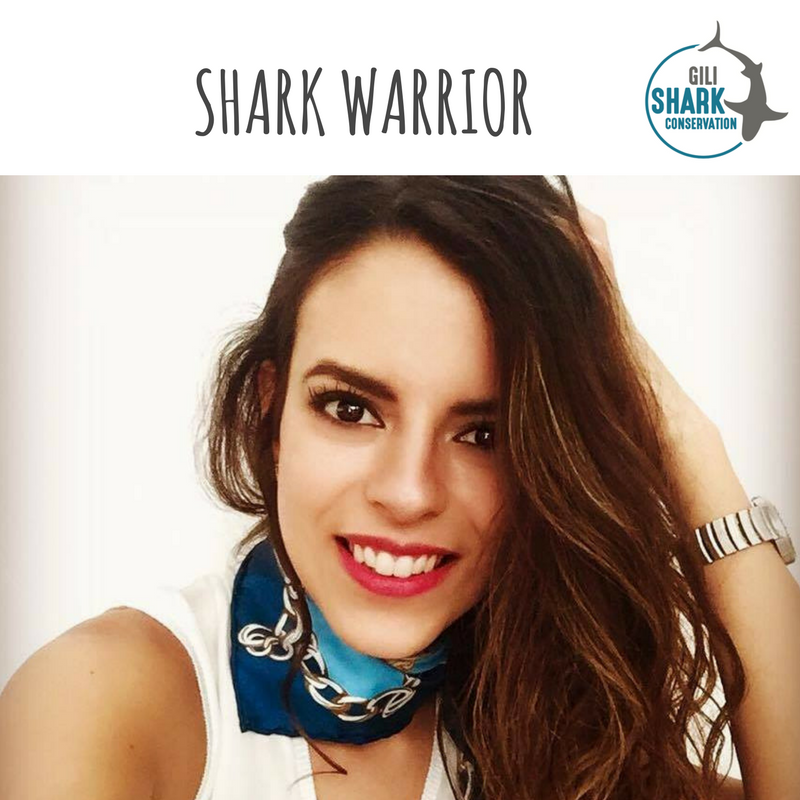 As a marine life lover and specially with sharks… this project let me got more involved in conservation and be able to help this magestic creatures. I’ve learned a lot and got my PADI Open Water and Advanced Open Water Certifications. The place is wonderful! Full of peace, happy people and nice vibes. It has been great being part of this amazing project, they have a great team and thanks to their great job they make this happen! It was love at first sight. In my first week of diving, I had completed 14 dives at 9 different dive sites. 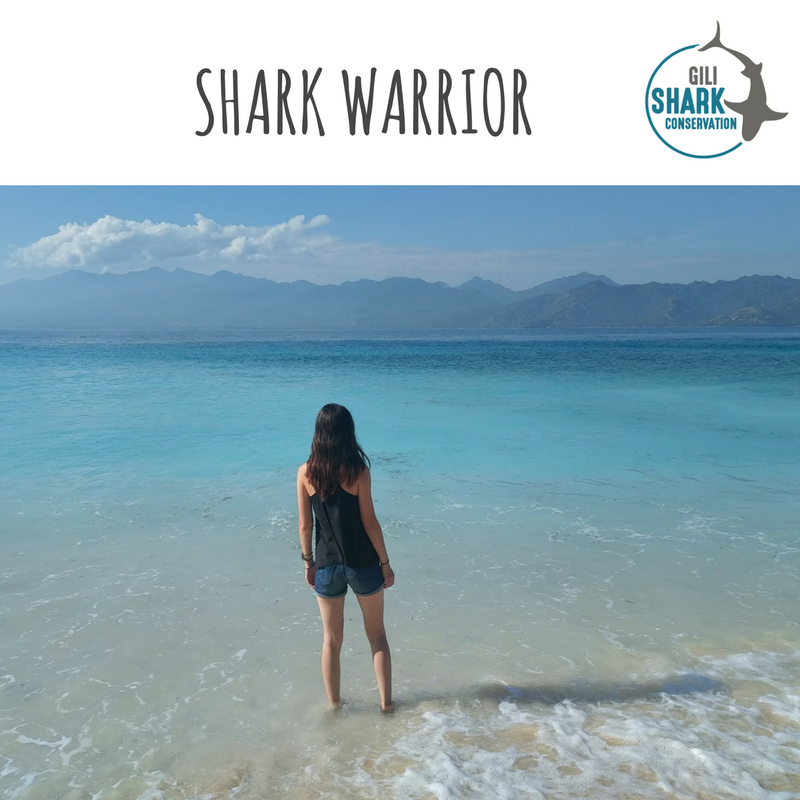 If you are interested in the Gili Shark Conservation project, there is one thing you should definitely be aware of; you are not just becoming a part of their team, you are becoming a piece to this entire community’s puzzle. The island is very small, which means, everybody knows everybody. It is so special. The shark team is extremely popular amongst the population, so if you join the project, you will become very well known very fast. The dive community is especially tight between every dive center thanks to beach clean ups and great restaurants, but the community at Oceans 5 is even more remarkable. I spent so much time at Oceans 5 during my courses, I stumbled into knowing every single instructor, dive master, student, receptionist, and boat captain very well. Every one of them is extremely friendly and kind with the best sense of humor. They never fail to make me shake my head and laugh. I came to the project having never dived in my life. I grew up in Kansas, USA, and moved to California less than a year ago. 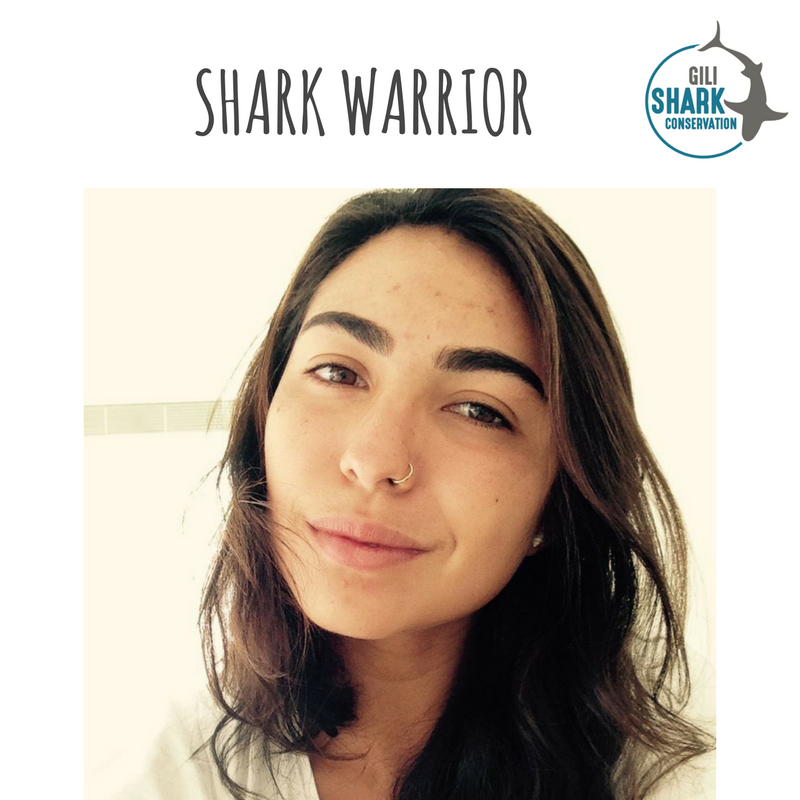 I joined this project because of my passion for marine life and environmental health. I knew Indonesia had one of the most endangered reefs in the world, and I wanted to do something to help it. I began my open water course the first week I arrived, and fell in love. I finished my course right in time for the weekend, so on my two days off, I decided to do my advanced course as well. In just my first week of diving, I had completed 14 dives at 9 different dive sites. I had also seen my first sea turtles, octopuses, rays, moray eels, and sharks. I think I’ve spent more time in the water than on land, but that’s how it should be! Like I said, the shark team is very popular on the island, and rightfully so. This team works very hard to educate and promote conservation on the island to everyone they can reach. The team runs a beach clean up every Saturday at different dive centers to make sure everyone is included, as well as attend other clean ups. Every work day the team goes on two survey dives and records sharks, turtles, rays, and indicator species. They drop a GoPro with bait and record that data as well. Taking the boat out with other divers, everyone is interested in our research. This is a perfect opportunity to further educate visitors on the status of the area’s sharks and reefs. During my time here, I have recognized the shark team as the environmental leaders of the island. Villa Nangka is a wonderful place to stay! The people that live here have become my family, and I am convinced I could write a book about the various characters. I am incredibly sad that my visit has come to an end, but I am so very grateful for the people I’ve met and the experience I’ve gained diving and collecting data. I am confident if it weren’t for school, I would be staying here as long as I can. As soon as I stepped off the boat onto Gili Air, I knew I had arrived in paradise. However, being immediately immersed in the sway of the palm trees, jingle of horse carts and the calm swish of waves on the shore was just the surface; below the surface is where I truly found paradise. Just a short “jalan jalan” from the beautiful shark researcher oasis of Villa Nangka, Oceans 5 dive center bustles with organized vivacity. Tanks clang, BCDs inflate and the shark team gears up to drop the BRUV (a baited remote underwater video camera to see sharks without humans nearby). A normal day would consist of 2 survey dives to log indicator species (aka shark food) sea turtles and of course sharks. We would see something exciting on every single dive without fail. Maybe it was the underwater slates that made it feel this way, but I found myself getting giddy with joy to be logging shark data underwater. This is real scientific research for shark conservation! How amazing to be a part of something so important. It is truly exhilarating having that feeling of knowing you are exactly where you’re supposed to be. And that is exactly how I felt being a part of Gili Sharks. 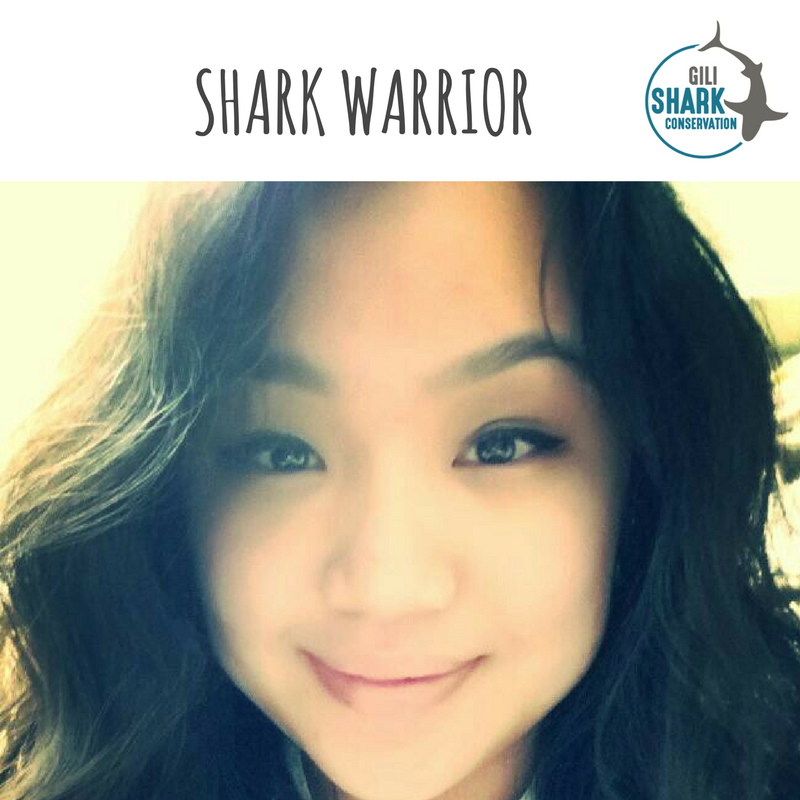 Being a part of the shark team helped me solidify my passion for shark research and conservation. I could not more highly recommend any experience. If I had to describe it in one word: life changing! I only had one week on Gili Air and as the fast boat took me to my new home at Villa Nangka from Bali’s Padang Bai the thought unquestionably crossed my mind that I didn’t have enough time to experience everything I wanted. 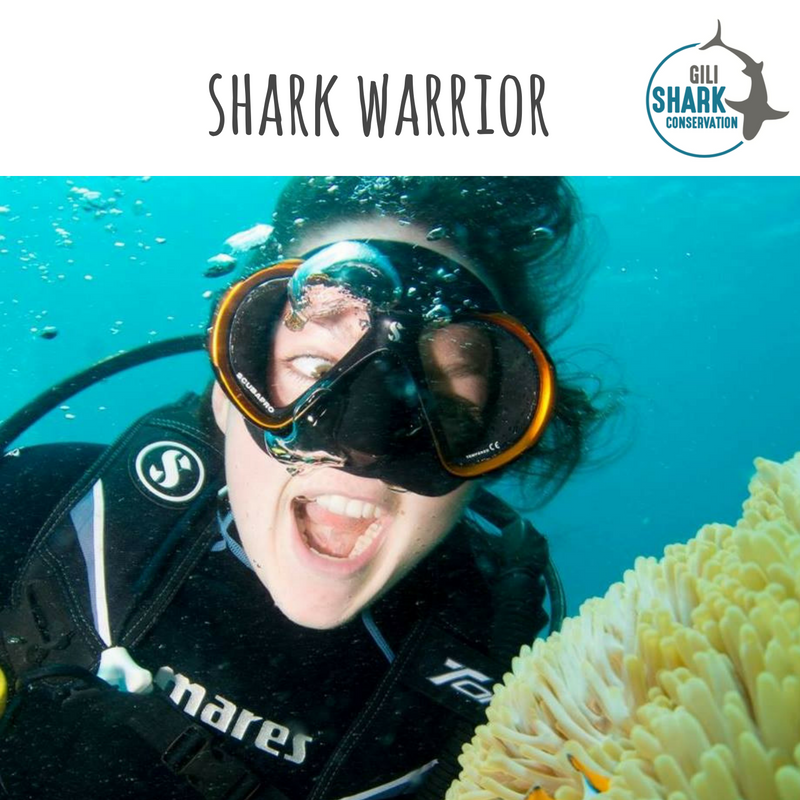 I didn’t have a scientific background, how could I possibly become a Shark conservationist and Research Diver in 1 week? But one week later I have gladly eaten my words with the same enthusiasm as the Moray Eels attempted to eat our Baited Remote Underwater Video lure. No more than a couple of hours after arriving I was donning gloves and combing Gili Air’s beaches for rubbish. Beach clean ups are a weekly occurrence here and I immediately felt at home. The community vibe was unreal as divers from all across the island congregated to remove debris and share diving stories. After a weekend of relaxing beaches, bintang, mangroves and mangos it was time to dive. A huge storm preventing any diving on the Gili’s had not long passed and divers seemed apprehensive as to the impending diving conditions but all concerns washed away as calmly as the current on my first dive at Turtle City. The gentle sloping reef revealed mantis shrimp, scorpion fish, beautiful groupers and the biggest shock of all – pre-historic sized green turtles unconcerned by us as we furiously scribbled down their size, gender, species, time and depth on diving slates. The roaming survey dives were hard to grasp to begin with. Sizing up bony fish, turtles, ray and sharks started as complete guesswork but by the end of the week my accuracy was for the most part in line with the program leaders observations. Next up. The BRUV. As a Dive Master I was fortunate enough to shadow the scientist as they dropped the BRUV each morning and actually get involved. For such a complicated looking piece of equipment the concept is really very simple. Collect and later sit down with a cup of tea to watch the final product. My first BRUV viewing revealed 3 distinct Moray’s attacking the bait we had placed giving the conservation team knowledge into what species live in that particular dive site. The days at Gili Shark Conservation did not end with diving. In the afternoons; BRUV footage was analyzed, survey data input and both Fish ID and Shark Ecology Workshops undertaken. By the end of my time here I didn’t want to leave – there were far too many dive sites to explore and sharks to survey but I left satisfied that I had learnt so much more than I could have ever hoped for. Thank you to everyone for making my short time on Gili so magical. I spent 6 weeks staying at Villa Nangka, spending half my time working for the Gili Shark Conservation project and the other half completing my Divemaster with Oceans 5 Diving. Compared to the rave-centric Gili Trawangan and tranquil Gili Meno, I like to think of Gili Air as the ‘Goldilocks’ island…because it’s just right! Air is small enough that I quickly got to know everybody that I passed on the way into work in the morning- it really felt like I was becoming integrated in a community. Villa Nangka is such a beautiful place to stay and you’re well looked after by the ‘rockstars’ Dan, Hendra & Pudja! Being a part of the Gili Shark Conservation Project was an excellent experience. Looking to build my skills as a research diver and as a diver in general, I have learned a lot in my time at the project. A day to day basis was a 5-day work week and a 2-day weekend. Wake up in the morning for a fish survey dive get back to the dive shop to input data and getting the chum ready for the BRUV. On a successful BRUV drop the BRUV would be dropped off in a specific location then picked up an hour later. Giving us 2 guaranteed Fish survey dives! Our busy mornings ended with some data entry and a BRUV watch at our beautiful home base villa Nangka. Villa Nagka meaning jackfruit is a beautiful oasis. Where the giant jack fruit tree shades the kitchen. A pool (which is an excellent commodity on the island) is perfectly centered right outside your front door. The island is a small friendly paradise for research. Rich with nutrients the reefs are brilliant with fish. This paradise island is easy to call home. With 2-3 survey dives a day this is a research paradise. The dive sites are thriving with aquatic life. This has been one of the most amazing opportunities to live in paradise researching our beloved predator. Research on this island and the opportunity to work with Gili Shark Conservation was an amazing experience. Q: What was your favorite part about the project? A: The Things I learned, regarding not only diving but all life aspects. And the friends I made and experiences I had. Q: How did you like your accommodation? Thanks to the staff for making this place a true home for me and a beautiful place to come back to every day. The work you put on this place is inspiring, and you are doing amazing. Hopefully in the future I will be here again. 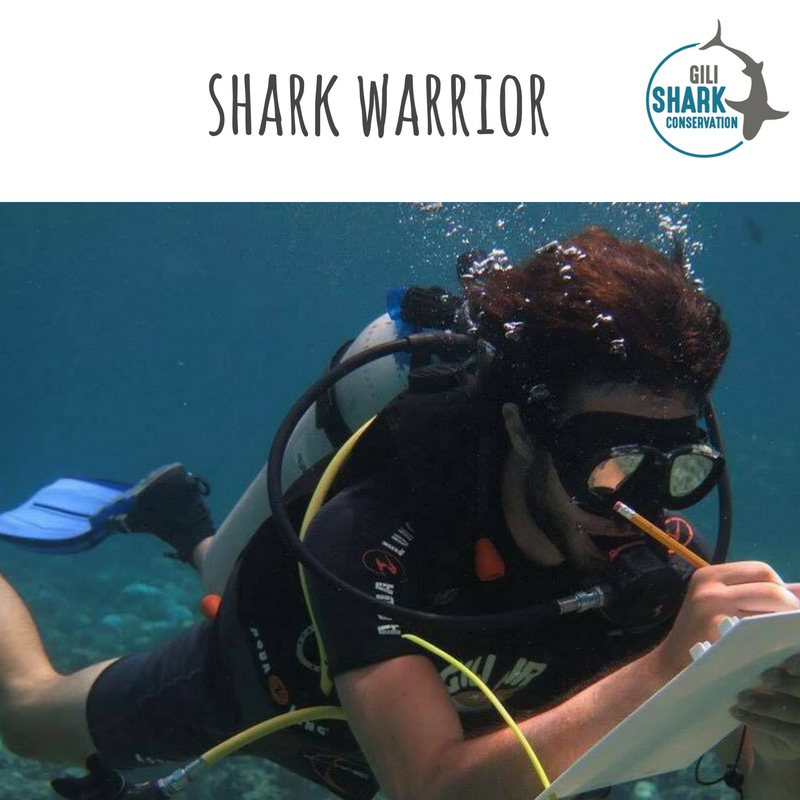 Q: What would you tell a future shark warriors planning their trip to the Gili Shark Conservation Project?